SPUD.ca fundraising is now supporting our Academy! 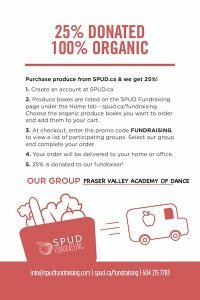 This September, we partnered with spud.ca and launched an ongoing fundraiser for our Academy. In our 10th year, we have finally found an ethical, healthy, local organization that we can support. 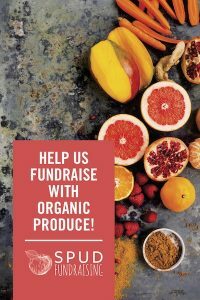 By including one of the fundraising boxes with your groceries (go to spud.ca/fundraising or Home->Fundraising on spud.ca), you’ll not only have healthy, fresh products delivered straight to your door, you’ll also be supporting the Academy. Spud.ca will donate 25% of fundraising box purchases. And if you have a standing order, it will all happen automatically. It couldn’t be easier! At Checkout, enter the Promo Code FUNDRAISING. Then select our group name “FRASER VALLEY ACADEMY OF DANCE” from the drop-down list. You only have to do this once – all subsequent orders will automatically include it.